Silver State Armory, now a part of Nosler, produces highly effective and reliable ammunition for a number of applications. Acquired in 2013 by Nosler, to meet the high demand for ammo and reloading supplies, these rounds now feature Nosler projectiles for anything from match shooting, to varmint hunting or self-defense. These 6.8 SPC rounds feature a 90-grain PPT bonded soft point projectile, loaded into boxer-primed, noncorrosive, reloadable brass cases. The AccuBond process keeps the jacket and core from separating, while the solid base allows for better penetration. 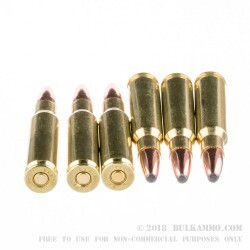 These are an excellent round for self-defense as they feature reliable, penetration and maximal weight retention and offer a muzzle velocity of 2840 FPS. 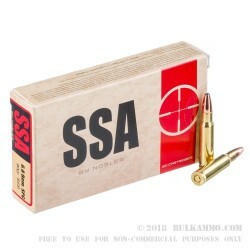 Each box of Silver State Armory 6.8 SPC contains 20 rounds. The 6.8 mm Remington Special was devised to be a replacement for the 5.56 NATO round in shorter barreled rifles for close combat situations. 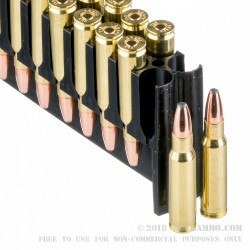 It has since grown into a popular hunting round, filling the void between the 5.56 NATO and the 7.62x39 mm.